Thanks you to anyone who lent a hand with some of the custom coding over the years. 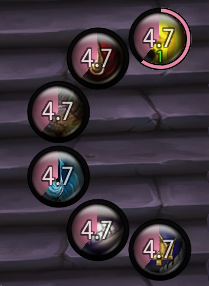 Inside portion of the Health/Resources area for Death Knight displaying health and an absorb overlaid also including Runic Power on the right side, also displays duration remaining of Runes. Inside portion of the Health/Resources area for Monk displaying health and an absorb overlaid also including Energy on the right side, also displays amount of charges and recharge time on ISB and Stagger amount and duration. Inside portion of the Health/Resources area for Druid displaying health and an absorb overlaid also including Rage on the right side. The exterior displays amount of charges and recharge time on Frenzied Regeneration, also displays the amount of heal for your Frenzied Regeneration. 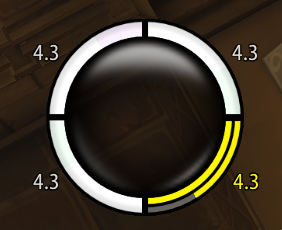 Inside portion of the Health/Resources area for Paladin displaying health and an absorb overlayed, also displays amount of charges and recharge time on SotR and on LotP/HotP, will also dynamically update when wearing the legendary helm to show 2 charges of LotP/HotP. Inside portion of the Health/Resources area for Warrior displaying health and an absorb overlaid also including Rage on the right side, also displays amount of charges and recharge time on Shield Block, will also dynamically update when talented into Vengeance displaying an inner orange duration ring for the current Vengeance buff, along with which buff is active (IP or REV). Inside portion of the Health/Resources area for Demon Hunter displaying health and an absorb overlaid also including Pain on the right side, and displays amount of charges and recharge time on Demon Spikes. Please follow THIS LINK for instructions on making your own circle for any spell for any spec/class in the game. Displays a trinket display for both trinket slots, which dynamically updates trinket position based on which trinket slot it is equipped in (top or bottom). Trinket icon and CD are dynamically updated, furthermore trinket proc Spell IDs can be added and will automatically display in the center, of course displaying top or bottom depending where the trinket is equipped. 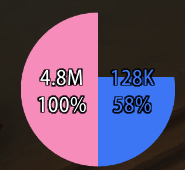 Can literally display any trinket and its proc in the game. Full suite that I used for ToS for boss buffs/debuffs/timers/alerts. Full suite that I used for Antorus for boss buffs/debuffs/timers/alerts.